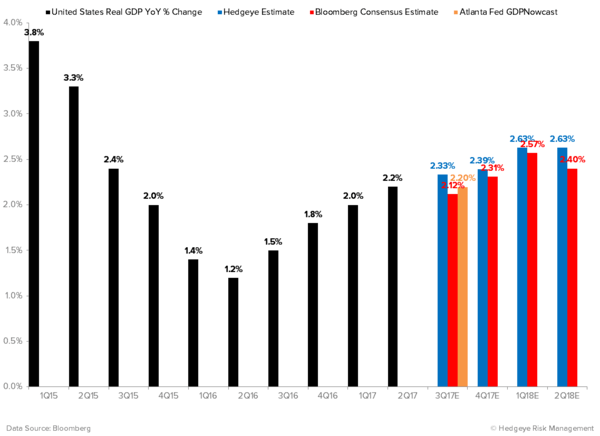 We reiterate our call for domestic economic growth to continue accelerating on a trending basis through at least 1Q18E. 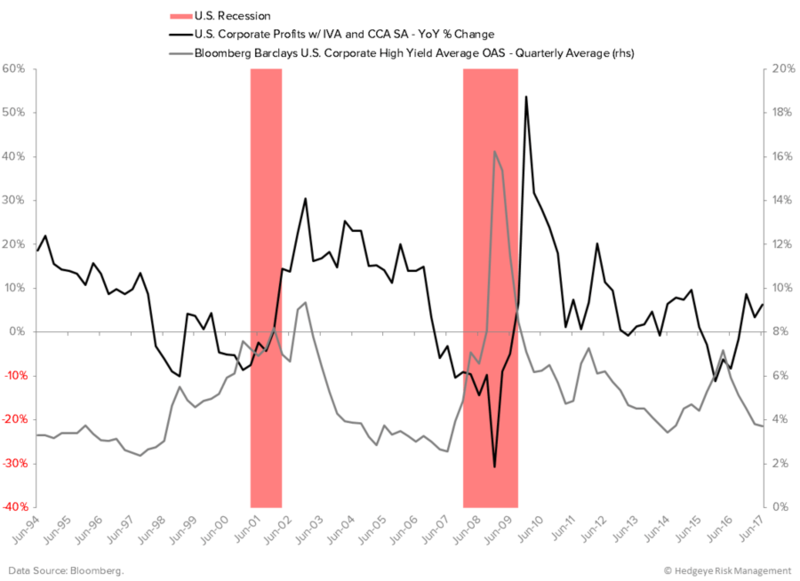 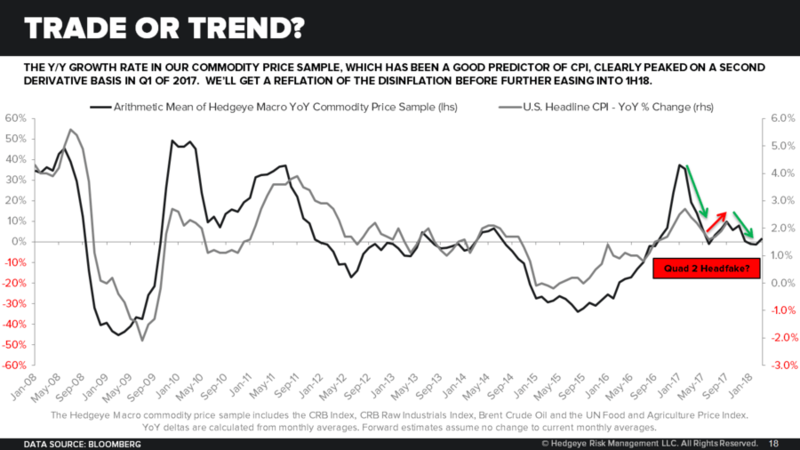 As we highlighted on our Q4 Quarterly Macro Themes presentation a few weeks ago, the reporting of Q1 earnings – which begins next April – is the first potential explicitly bearish catalyst we can see for this raging bull market. 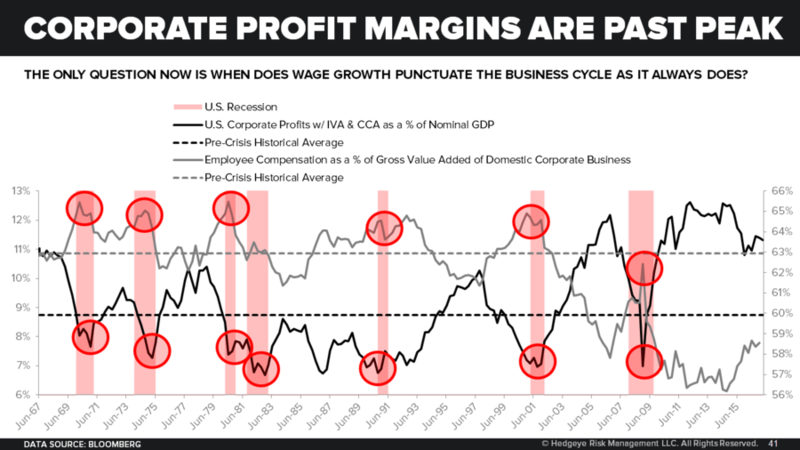 U.S. growth bulls would be well served to grip it and rip it until then – and potentially beyond considering that tax reform remains a catalyst for further upside in both corporate profitability and economic cycle terms. 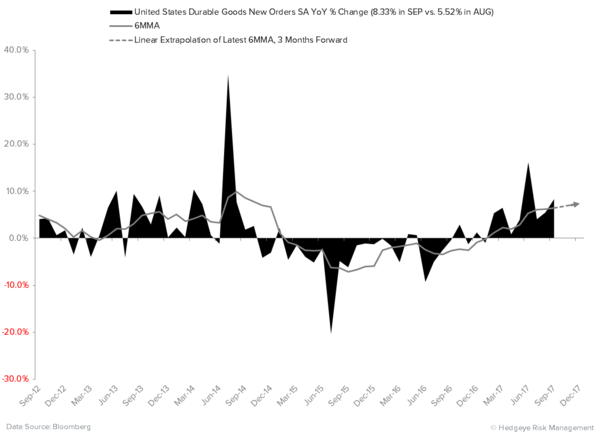 Headline Durable Goods Orders rose +2.2% MoM and +8.3% YoY in SEP to close out Q3 on a high note. 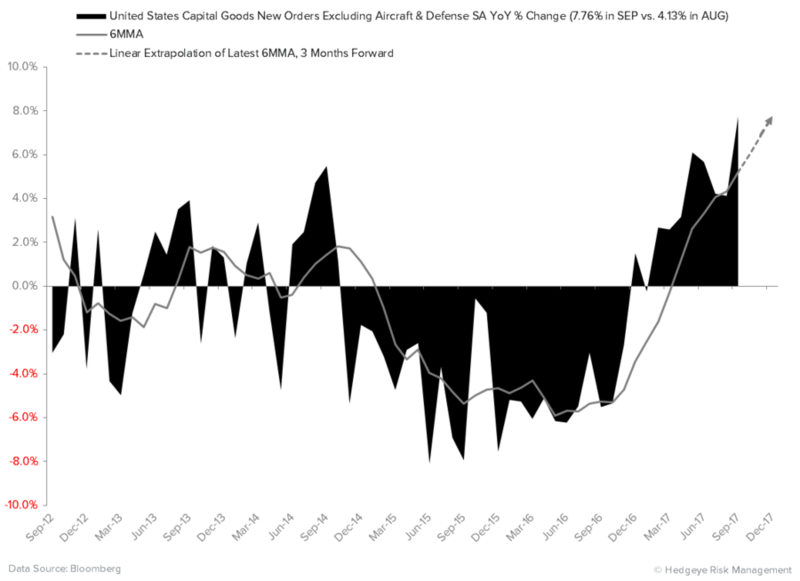 While Private Aircraft Orders (up +62.7% YoY) helped juice the headline growth rate, strength was indeed broad-based. Core Capital Goods Orders accelerated to a 65-month high of +7.8% YoY, mirroring the growth rate of domestic corporate profits. 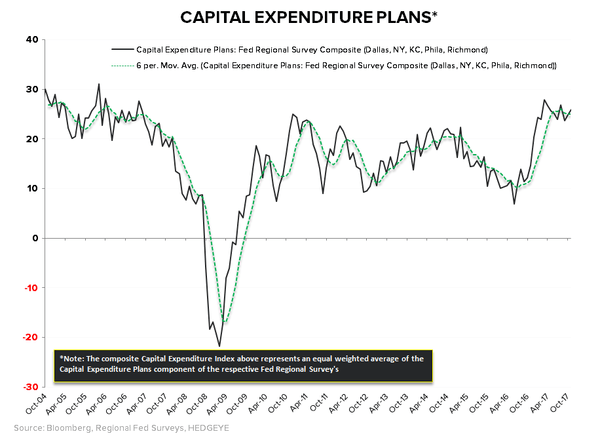 As a proxy, Russell 3000 constituents’ EPS growth is tracking up +8.1% YoY throughout the Q3 reporting season to-date with ~20% of companies having reported. 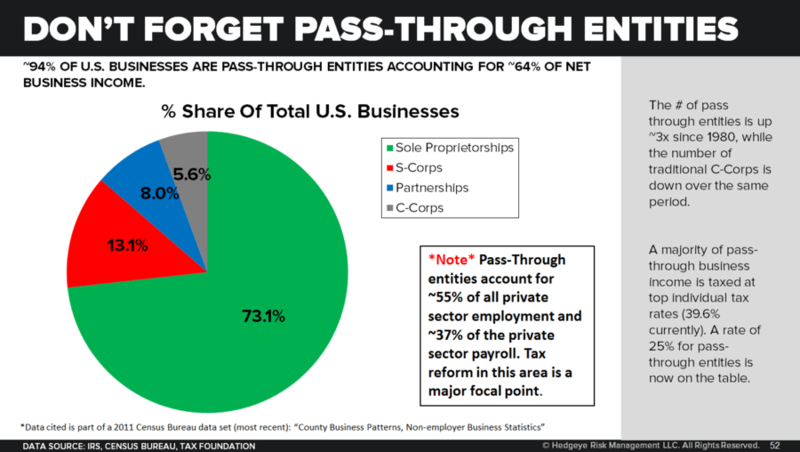 After two consecutive years of negative corporate profits (-0.8% in 2015; -1.8% in 2016), U.S. businesses are finding themselves in a position to have to reinvest in their businesses or face the tax consequences of not doing so. This behavioral dynamic is lost on U.S. growth bears who are myopically anticipating a lack of retroactivity in tax reform to instigate a pause in business investment here in 2H17. 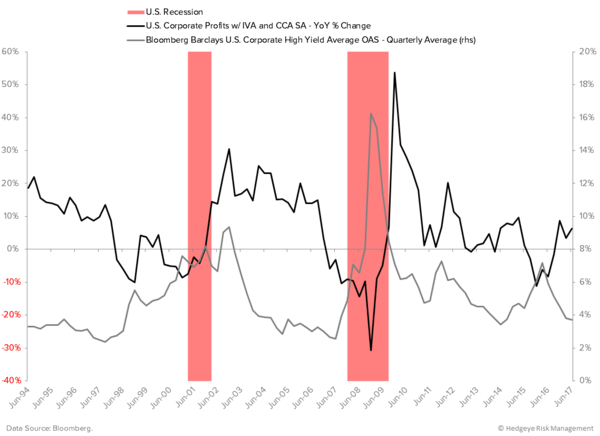 Much improved financing conditions are contributing to the rebound in business investment as well. Indeed, these noteworthy accelerations in “hard data” have been hard for the bearish “soft data” crowd to swallow all year. If your favorite macro strategist missed calling for the 2H15-1H16 mid-cycle slowdown and [broad-based] corporate profit recession AND/or the 2H16 recovery in domestic economic growth and corporate profits, perhaps instead of discussing their outlook the next time you meet with them, your team would be better served to kick the tires on their research process instead. 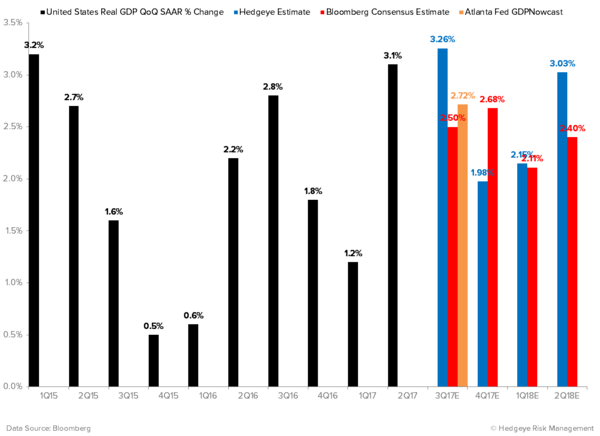 Moving along, with the advent of today’s stellar Durable Goods and Capital Goods reports, our Real GDP forecast for 3Q17E ticked up +2bps from our previous estimate to +2.33% YoY. That figure translates to +3.26% QoQ SAAR (up +8bps vs. our previous estimate), which itself compares to +2.72% for the Atlanta Fed and +2.5% for Bloomberg Consensus. 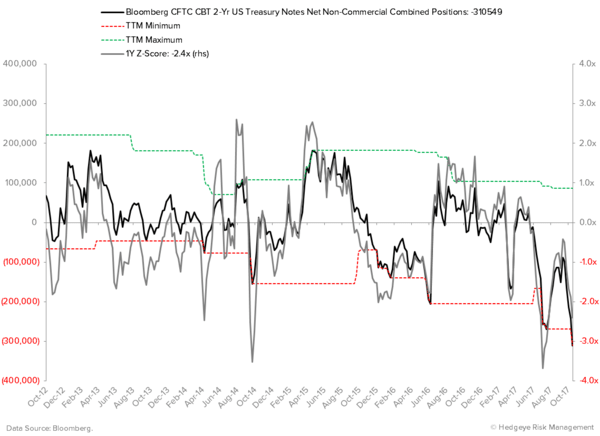 That puts us slightly in #Quad2 for 3Q17E – an outcome the market obviously picked up on in terms of the rebound in reflationary factor exposures. When that bounce culminates was among the key topics of discussion here in Boston and we’re currently thinking “sell-the-news” on the now-priced-in Fed rate hike for December 13th. 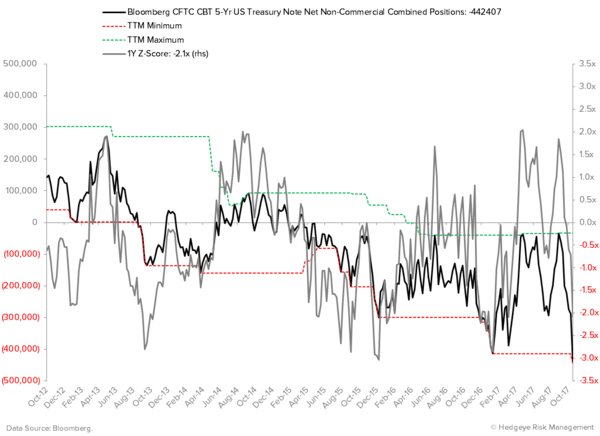 Consensus remains very crowded on the short side of 2Y and 5Y Treasury notes – especially in the context of our outlook for inflation over the next ~6 months. 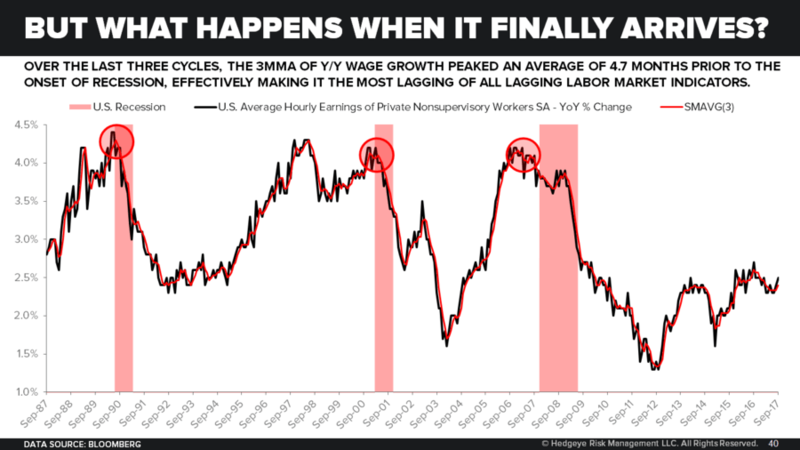 One thing that would cause us to abandon that plan of attack is a marked acceleration in wage inflation here in Q4 – which is not an inconsequential starting point given the trending decay in labor market slack seen throughout the YTD. 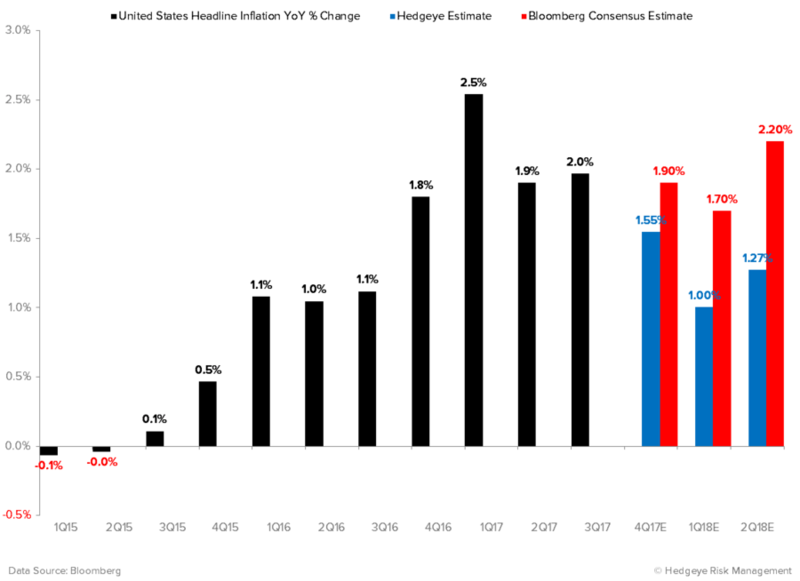 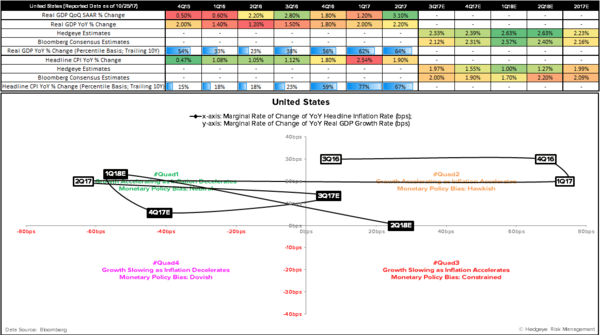 This more traditional driver of inflation is something neither investors nor the Fed has had to contend with throughout this economic expansion and the resulting monetary tightening would ultimately truncate this business cycle – making meaningful tax reform all that much more necessary to perpetuate upside past the likely 1Q18E peak in corporate profitability. All told, we reiterate our call for domestic economic growth to continue accelerating on a trending basis through at least 1Q18E. 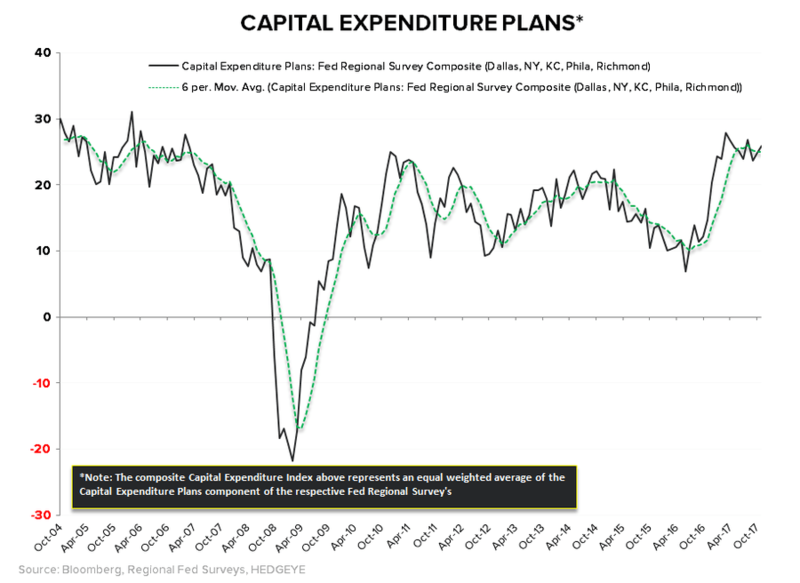 As we highlighted on our Q4 Quarterly Macro Themes presentation a few weeks ago, the reporting of Q1 earnings – which begins next April – is the first potential explicitly bearish catalyst we can see for this raging bull market. 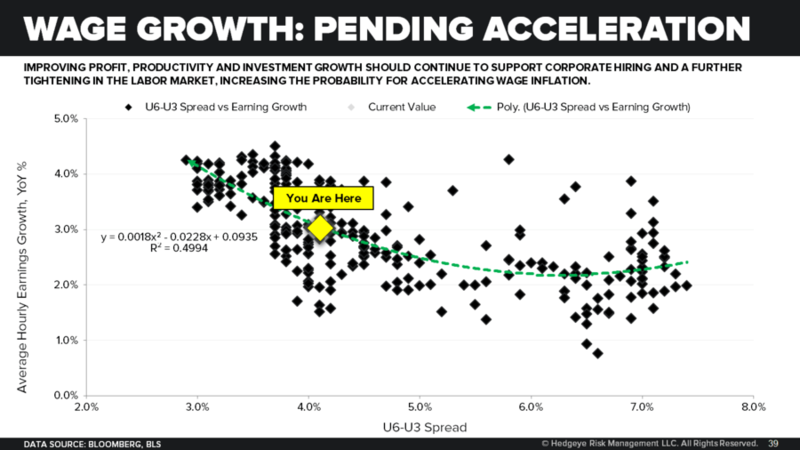 U.S. growth bulls would be well served to grip it and rip it until then – and potentially beyond considering that tax reform remains a catalyst for further upside in both corporate profitability and economic cycle terms.